This entry was posted in America Canada and tagged Canada Green Card PR Visa on April 30, 2015 by Blog Author. The world is full of opportunities for those who wish to flow with the tides of time. In order to find work in your dream destination, you need to know which visa option is going to work best for you. 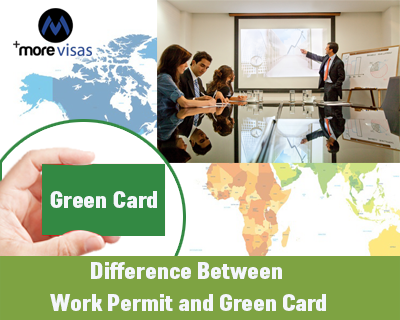 There are basically two work permit visas – Work permit and Green card. There is a difference between these two visas, and while opting for either, one should be aware of what works best for them. • Work Permit Visa – This is a temporary visa which is given by an employer to a person stating that the individual can come and work for his company. It is in the form of a letter and designates the location to be the same as that of the employer. The other aspect to this is that this is an agreement and every time it is about to lapse; you need an extension for the same for the employer. In case you want to move jobs, you can’t do so without holding a No Objection Letter (NOC) from your present employer. You need a fresh work permit for the same. You cannot avail these benefits under a work permit. On work permit, individuals are not permitted to pursue studies, if they are interested they can cancel their work permit and apply for student visa. However if the applicant has a PR visa, then he can take up further studies without cancelling PR visa. Once the individual attains the citizenship status, they can travel across the nation.